When Elon Musk wrote “Hyperloop Alpha,” a paper challenging the world to accelerate the development of a functional hyperloop system, a group of engineering students at Delft University dived in to enter the competition for the best pod design. The Delft team placed second to the MIT team. Ten of the thirty-three-member team took a year off and are building a pod to compete with other winners on Musk’s hyperloop test track in Hawthorne, California. Imagine pods—7.5 feet in diameter with ergonomic chairs and shoulder belts—thrusting you up to 760 miles per hour through steel conduits from San Francisco to Los Angeles in 35 minutes, for the cost of a bus ticket. That is the vision of the Hyperloop, 700 miles of low-pressure tubes running up and down California. The promise of a Hyperloop is speed; the virtue is how little energy it uses to move people and cargo. Estimates per passenger mile are 90 to 95 percent less than planes, trains, or cars. Hyperloops are levitated by magnets powered by solar and wind power, with the only real friction being the residual amount of air in tubes. Linear-induction motors, the same kind used in airport shuttle systems, would be used to start and accelerate the passenger pod. A center rail with magnets on both sides would act as a stabilizer at high speed and an emergency braking system if needed. There are now several companies in the world striving to create complete Hyperloop systems. Successful test runs have achieved 330 miles per hour in open air, but Hyperloop will have to overcome challenges from safety to infrastructure costs to permitting. New York City…pneumatic tube mail system: Cohen, Robert A. “The Pneumatic Mail Tubes: New York’s Hidden Highway and Its Development.” In Proceedings of the 1st International Symposium on Underground Freight Transport by Capsule Pipelines and Other Tube/Tunnel Systems, Columbia, Missouri, pp. 189-202. 1999.
vision of the Hyperloop: Musk, Elon. Hyperloop Alpha. 2013. https://www.tesla.com/sites/default/files/blog_attachments/hyperloop_alpha3.pdf. Robert Goddard…imagined vactrains in 1910: “The Future of Transport: No Loopy Idea.” The Economist. August 17, 2013.
difficult challenge…700 miles per hour: Arieff, Allison. “Can a 700 M.P.H. Train in a Tube Be for Real?” New York Times. May 19, 2016.
agreement with Dubai’s Port of Jebel Ali: Phillips, Erica E. “Hyperloop Technology to Be Studied as Shipping Tool.” Wall Street Journal. August 16, 2016.
door-to-door pod system…in Dubai: Hanif, Nadeem. “Abu Dhabi to Dubai in 12 Minutes? World’s First Hyperloop Coming to UAE.” The National. November 8, 2016.
routes…for cargo: Reynolds, Emily. “Russia Signs Deal for Its Own Version of Hyperloop: Pilot System Could Provide a High-Speed Route Between Moscow and St. Petersburg.” Wired. June 22, 2016; Reynolds, Emily. “Is ‘Hyperloop’ Really Coming to Europe?” Wired. July 6, 2016.
routes from Bratislava to Budapest and Vienna: Guerrini, Federico. “First Hyperloop Track Might Be Built Between Vienna And Budapest.” Forbes. March 10, 2016. “Transportation is the new broadband”: Bradley, Ryan. “The Unbelievable Reality of the Impossible Hyperloop.” MIT Technology Review. May 10, 2016.
the Jevons paradox: Owen, David. “The Efficiency Dilemma.” The New Yorker. December 20 & 27, 2010. 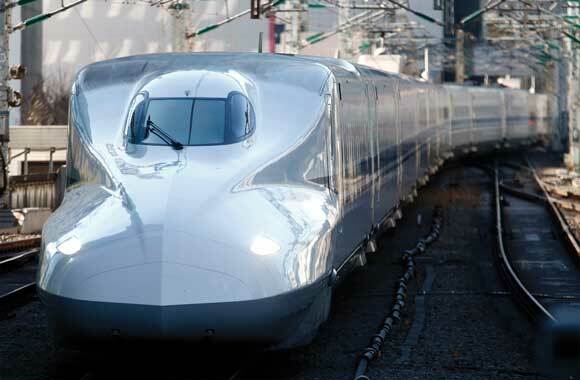 High-speed rail is the fastest way to travel distances between 100 to 700 miles. Compared to driving or flying, it reduces emissions up to 90 percent. Most trains are powered by diesel-burning engines. Technology and operations can improve fuel efficiency, and rail electrification has the potential to provide nearly emissions-free transport. Riding a streetcar, bus, or subway—rather than driving a car or hailing a cab—averts greenhouse gases, relieves traffic congestion, and reduces air pollution.